Miner jokes the design was aimed at "snobby album purists." Among its subscribers were a small legion of user interface and user experience designers — one reason you see little touches of Rdio everywhere you look. It’s there in the blurred album art that you now see in the background of other streaming music services. It’s there in the translucent panes and gradients that Apple introduced with iOS 7. It’s there in the redesigned app for Pandora, the company that ultimately acquired it. For its part, Pandora says that Becherer and his team will build a new on-demand product for the company using Rdio’s intellectual property. It is expected to launch in late 2016. Rdio wasn't the first music streaming service I tried, but it was the first one I loved, and that was because of its tasteful design and focus on albums and discovery. You could tell that the people who made Rdio loved music and the idea of sharing music. They cared. And ultimately, focusing too much on design touches while avoiding basic aspects like growth and marketing spelled the end of the company. There's no doubt in my mind – Rdio was the most elegant streaming service. Its social, discovery, and playback features (good queue management, sort by label, heavy rotation among friends, excellent weekly releases – just to name a few) were simply unrivaled. Rdio was great. I used to write about Rdio a lot, and you can still find all my old posts and screenshots here. I'll miss Rdio. Today we’re happy to announce we’ve converted our entire catalog of over 30 million songs to high-quality AAC audio. Listeners around the world now have four sound quality settings to choose from across iOS, Android, and the web. All Rdio users can choose between data-efficient 64 kbps all the way up to 192 kbps. Rdio Unlimited subscribers now also have the option of listening in pristine-quality 320 kbps. Plus individually select your audio settings for a variety of uses, whether you’re using Wi-Fi or cellular streaming or listening to offline downloads. Rdio is late to the 320 kbps party, but better late than never. I like how the updated iOS app has individual settings for streaming and download quality over WiFi and Cellular connections. And speaking of the iOS app, it was also updated with new iOS 8 features and support for CarPlay. I couldn't test the latter as I don't have a CarPlay receiver, and the fact that Rdio is now optimized for the iPhone 6 and iPhone 6 Plus is pretty much a given with app updates at this point. The use of interactive notifications by Rdio is clever: if someone shares a song or album with you, you can swipe down on the Rdio notification to view it or start playing it. The Play button has to launch the Rdio app first, but it's still a nice shortcut that should remove some friction from sharing with other Rdio users. In the face of growing competition in the streaming music market, Rdio, a four-year-old service that charges for online subscriptions, has moved into a new phase with abundant free music — as well as free music’s ever-present companion, advertising. As The New York Times reports today, Rdio has done well over the past few years, but it is clear that other competitors (most notably Spotify) have been doing far better by placing a strong focus on a freemium business model. As a result, today's updates to Rdio aren't much of a surprise to me, but I'm glad they have also taken the time to once again refine the design of their apps. For those curious, the free version of Rdio will be available in 20 countries initially and will allow unlimited access to stations. Rdio Unlimited will unlock the ability to play albums and playlists, as well as remove ads for $9.99. Rdio’s move is a result of a deal with the radio network Cumulus Media that was announced a year ago, in which Cumulus was granted an equity stake of at least 15 percent in Rdio’s parent company, Pulser Media, in exchange for providing content and promotional services that Cumulus says are worth $75 million over five years. The new design is not a major departure from their existing designs, but rather a welcome refinement. For example the new apps get rid of the confusing to distinguish 'Heavy Rotation' and 'Top Charts' sections and are instead replaced with a far more understandable section called 'Trending'. There is also a new 'Browse' section which has curated Rdio stations into various categories including 'Top Stations', 'Aussie Hits', 'Alternative' and 'Fitness'. The other big new feature isn't actually available yet, but there will also be a 'Home' tab which promises to be "an evolving feed of personalized music stories that surfaces the best of Rdio in a single destination". It'll be built from what you listen to, your friends listening activity, recommendations from Rdio, and other factors. On the whole it seems like a more advanced music discovery tool than the currently available 'Recommendations' page, which is mostly based on your music listening habits. 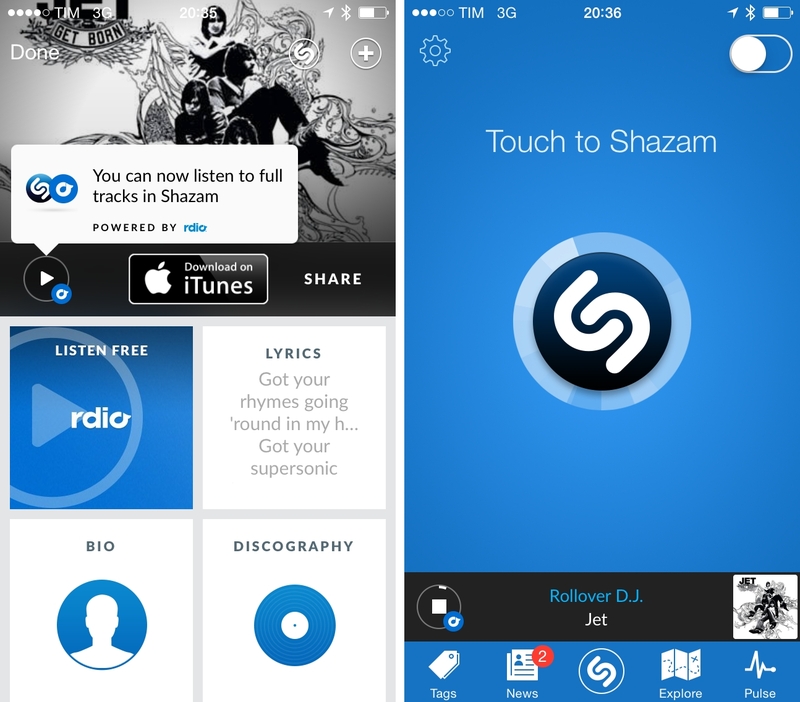 Popular music tagging app Shazam received a major update today, which adds full track playback capabilities powered by Rdio. Today, we’re thrilled to announce that we are growing our team with the acquisition of TastemakerX, a leading music discovery and curation service. Based in San Francisco, TastemakerX was founded in 2011 to help artists connect with fans. TastemakerX enables listeners to discover new music, build and listen to virtual collections, and view artists based on social discovery. The interesting part, as noted by Brad Hill at RAIN News, is that this acquisition follows the news of Spotify acquiring The Echo Nest (the leading music intelligence company) back in March, when I purposefully included a note on third-party services using it for essential music discovery/recommendation features. Rdio announced they'd stop using The Echo Nest after the company was acquired (smart and obvious move). Here's a VentureBeat article from last year with more details on TastemakerX. As the initial step in this program, Rdio has begun to convert its entire existing catalog to the AAC format and will deliver 320KbPS as our new standard — without increasing our price. In addition, and as part of our ongoing commitment to the artist community, Rdio will work closely with artists and labels from around the world to continue to raise the bar higher on streaming quality where sufficient network bandwidth exists, and to improve stream delivery in markets around the world where network quality and bandwidth are often inconsistent. Since its launch, Rdio has always streamed at a highest quality of 192kbps, with variable bitrates for mobile devices. 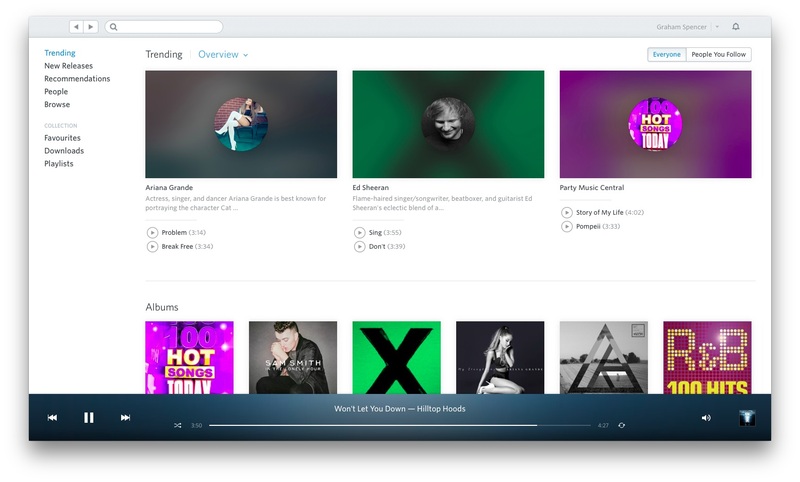 Rdio is the latest music service to start offering 320kbps streams, as both Spotify and Beats Music already provide higher quality to paid subscribers (Beats Music included the option since day one). Music streaming service Rdio has today released an update to their iOS app that brings a new design for Profile views, a sleep timer, and various UI improvements for iOS 7. The Rdio app has been regarded as one of the iOS 6 apps that, in hindsight, got the design of iOS 7 right before Apple even unveiled iOS 7, but, after the release of the OS in September, Rdio hasn’t done much to turn what was a forward-looking iOS 6 app into a real iOS 7 app. Today, version 2.5.4 shows an iOS 7 keyboard for search and it brings subtle changes to backgrounds, but otherwise Rdio hasn’t received a major redesign for iOS 7 yet. Profiles views have been updated, showing avatars in the middle of the screen on a blurred background of the profile picture itself. The new design is available for both your personal profile and other people’s profile views, and it gives you easier access to a person’s “FM” station as well as the song they last played on Rdio. In this update, Rdio also included a sleep timer feature: from the Settings, you can choose to automatically stop music playback after 15 to 120 minutes, which is a handy addition for people who like to put on some music before bedtime. You can get Rdio 2.5.4 on the App Store. In a move that doesn't come as a surprise following Apple's entrance in the online radio space with iTunes Radio, music streaming Rdio is announcing today that the "Stations" feature will be free for all non-subscribers. Until today, people could try out Rdio's full feature set for 14 days, then sign up at $9.99 per month; after today, Stations will remain always available -- without the 14-day limitation -- in Rdio's mobile apps. We’re inviting everyone to listen to all of Rdio’s stations, drawing from over 20 million songs, through our mobile apps for iOS and Android without ever pulling out the plastic. Even if your subscription or trial has ended, you’ll be able to choose from 10 different station types — including stations based on artist, song, and over 400 genres plus You FM, a personalized station based on your listening habits — so you can keep the music playing for as long as you want at no cost to you. To get the complete Rdio service, which includes on-demand listening of tracks and offline song storage, the user still has to pay $9.99 a month. But executives hope that if the people who complete the free trial continue listening to Stations, they’ll be more likely to subscribe in the long run. "We don’t need you to subscribe right away," says Chris Becherer, vice president for product, in an interview with The Verge. "You can live inside Stations for a long time. We think that over time, you’ll start building up your collection, building up your favorites. And whenever you do subscribe, all that stuff is ready to go. By combining The Echo Nest’s Taste Profiling technology with Rdio’s beautifully dynamic design and rich data on listening history, we’ve unlocked an unprecedented personal radio experience for all mobile users to enjoy for free. I have been listening to Rdio Stations for the past few months, and the quality of their recommendations is impressive. The "Your FM" personalized station has been particularly accurate in the songs and artists it recommends, and I believe that if Rdio can scale well enough to accomodate free users on Stations without sacrificing quality, the feature could help in selling more subscriptions. It'll be interesting to see the repercussions of Apple's iTunes Radio and Rdio's new free option in a few months. Rdio for iOS can be found here. Hot on the heels of our Stations launch, we’ve built Recommendations as another great means of effortless music discovery. Powered by technology from The Echo Nest, the new feature provides a steady stream of new music recommendations — including albums, stations, and playlists — based on what you listen to most and who you’re following. I've long wished for Rdio Recommendations to come back, as I think they used to a great way to find new music in the Rdio 1.0 days. Rdio has changed in the past two years, and the need for Recommendations was partially obviated by Your FM and stations. However, I'm looking forward to seeing if the dedicated section will be as good as the original one used to be – particularly in how it should recommend entire albums and stations. 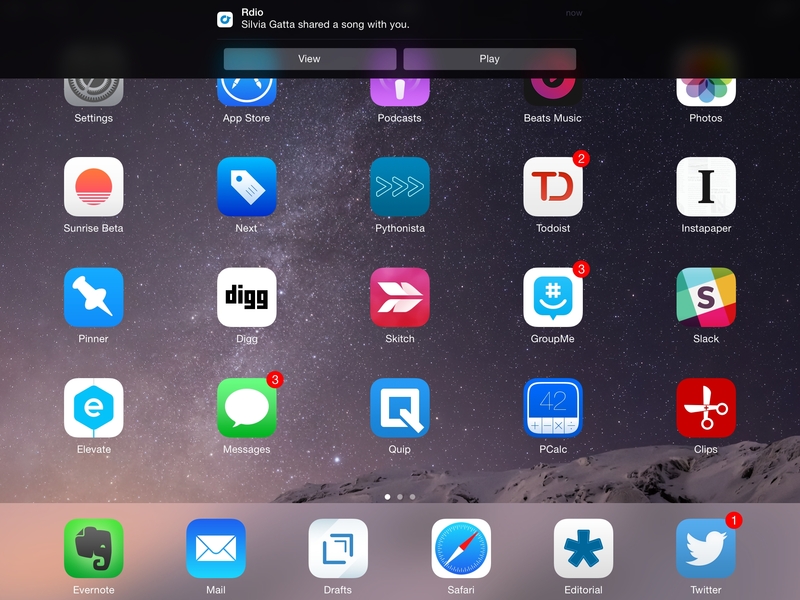 According to Rdio, Recommendations will be added to the iOS app “soon” – hopefully alongside an update for iOS 7.